Marya Farah, legal research consultant with a human rights organization in the West Bank, was a visiting speaker at Case Western Reserve University (CWRU) School of Law, on October 11. The event was held in the Moot Court, yet “moot” or “debate” was discreetly discouraged. We learned that the woman with the mic was told not to extend it to those whose opinions might prove inconsistent with the speaker’s narrative. Professor of Law Avi Cover invited Farah to address students seeking Continuing Legal Education (CLE) and aptly served as her “cover” when she would decline to address certain issues. A self-described Palestinian, she has come to delegitimize and denigrate Israel and the international Jewish community; this is stealth jihad. She repeatedly spoke of Israel as the occupiers of areas she referenced as “occupied Palestinian territories” (OPT), and supports boycott-divestment-sanctions, BDS, against the Jewish state, ignoring the 4,000-year history of Jewish presence, preceding Christianity and Islam by more than two millennia. Clearly not expansionist, Israel’s legality stems from the historic, indigenous and legal rights granted pursuant to valid and binding international legal instruments accepted by the international community. Her boundaries have changed only as a result of her winning a defensive war against the armed aggression of five Arab countries. Here it should be noted that the Palestinian nomenclature designation is the largest hoax of the Twentieth Century, and it continues today as part of the plan to eradicate the Jewish State, taking control of small parts at a time. The territories are neither “occupied” nor Palestinian; there is no Palestinian sovereignty. One slide was described as a section of the wall that separates Israel from “Palestine,” and its serious inconvenience to the Palestinians. Farah did not say why the wall exists; it was begun in 2002 to protect Israel’s citizens when Arab terror attacks had reached unprecedented levels. Neither did she mention the considerable expense to Israelis to fund the barriers, bomb shelters, and all manner of security measures, so this wall is no frivolous undertaking. 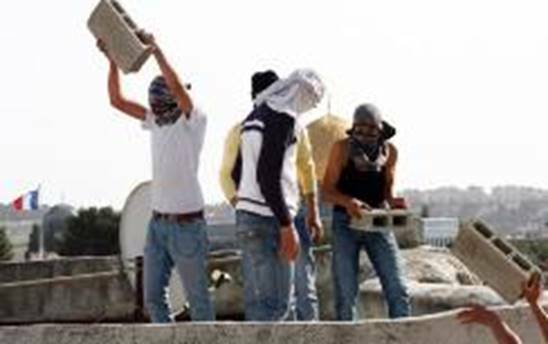 Of course, despite the protective barrier, Palestinians have killed or maimed many thousands of Israelis through suicide bombings, stabbings, explosives, rocket fire, and mortar shells, and most recently the use of incendiary balloons and fire kites that have destroyed more than 3,000 acres of forestry and agricultural land, livestock, wild animals, homes and industry – not to mention lung ailments from the smoke and Post-traumatic Stress Disorder. The speaker also criticized the color-coded license plates on cars that made it difficult for friends from different city sections to meet but failed to explain that the color-coding is necessary to distinguish the vehicle of a potential terrorist. She spoke of the inconvenient road system, but not that they were designed to ensure safe access by Arabs and Israelis alike, and thwart Arab rock throwers from hitting passing Israeli cars and causing damage and deaths. Another gripe was the tiresome checkpoints, again without clarifying their purpose of preventing armed terrorists from entering crowded places. Another slide was one of bulldozer moving earth on a deep embankment, which she identified as the destruction of homes. Houses are destroyed if built illegally, and when they are the homes of the families of martyred killers of Israelis. Israel has learned that this destruction is the greatest deterrent to terrorism because families will actually report a potential terrorist in order to avoid losing their home. The excavator might also have been demolishing a terror tunnel, through which terrorists gain underground access into Israel proper, to kill Jewish children and families. Farah lamented the assault and war (Egypt, Transjordan, Syria, Saudi Arabia, Lebanon, Iraq, Yemen, attacked Israel) that immediately followed Israel’s Independence in 1948 – and the 462,000 to 750,000 Arabs who remained homeless. However, they had been commanded to leave by the Arab military leaders, with a promise of return upon the Arab victory. Another 160,000 Arabs accepted Israel’s invitation to stay and live as Israeli citizens. It is the subsequent generations of those who fled that are now hostages for negotiation. No one cited the 850,000 Jews who were expelled from Arab lands around the same time. They were absorbed by Israel and some European countries, not held as displaced pawns. The war of 1967 was yet another attack by five Arab countries (Egypt, Jordan, Saudi Arabia, Syria, Iraq) on Israel, yet Marya Farah said this was a war over water rights! Absolutely not. We spoke to Professor Cover after the event and Q&A. He posited that he wants no barriers around Israel and that it was unjust that the many were inconvenienced because of the actions of the few. The Koran still commands death to Jews and weaponizes their children to kill Jews. If indeed, only 10 percent of the Palestinians were overcoming the border wall with firebombs and explosive devices, launching thousands of arson kites and booby-trapped incendiary balloons into Israeli communities, they are still killing indispensable people and wildlife. Would the American citizens accept being blown up in coffee houses, pizzerias and schools by the 10 percent, or would they demand that their government protect them? I am most dismayed at the American professor who identifies with a people who yell, “Death to Israel,” and “Death to America,” while expressing no sympathy for America’s steadfast ally, Israel, whose people are consistently attacked and slaughtered. Finally, I also had a moment to ask Farah where, exactly, was her country of Palestine and when was it established. She hesitated only momentarily and said she would not deal with a challenging question, and that I was denying her identity as a human being. No, but the land is not “occupied” by Israelis. Israel’s legal presence has been accepted by virtue of her history, documentation, and that the Jews’ built a thriving nation out of desert and malarial swampland; the only illegality is the “Palestinian” presence. By this time, she had backed away so much, that she was against a wall, inviting others to queue up to her new position. In summation, we heard not one iota of truth during the entire session. I fault the school’s programming director, Professor Avi Cover, and his choice of speaker, who together altered the facts of every sub-topic raised. This was no impartial criticism of a country or its policies, but anti-Zionist revisionism. How is it that pure propaganda is acceptable for a CLE class? How are the students perceived to benefit? How did this activity qualify for law credit? The majority of the attendees seemed either to not understand or not care to question the allegations, but surely they would remember some of the misinformation; a seed of hate has been sown, and there was no debate from anyone prepared to counter the fallacies. In addition to current rules by the OSCE (Organization for Security and Co-operation in Europe), and the commitment to ensure full respect for human rights and fundamental freedoms, I recommend that CWRU review the Trump administration’s new definition of antisemitism in schools, which includes the demonization or delegitimization of Israel. For the sake of academic and intellectual honesty, CWRU is obligated to hold a CLE that presents and defends Israel’s position. I herewith expressed my indignation at what transpired and asked that the department be called to account. I look forward to a reply and explanation of how this may be avoided in the future. Palestinians throw deadly missiles on passing cars. This entry was posted in Politics, Survival, Terrorism. Bookmark the permalink. Bomb the leaders into eternity. Most Palestinians would prefer to live in Israel. They have more rights and opportunities there and are imprisoned in the West Bank and Gaza.